Held Feb. 16-19 at the BedBug Central headquarters in Lawrenceville, N.J., the camp was a hands-on training event that covered all aspects of bed bugs, including: biology, history, treatment and monitoring, focusing on BedBug Central’s "no hands" approach. LAWRENCEVILLE, N.J. — From Arizona to Pennsylvania, pest management professionals from all over the country made the journey to Lawrenceville, N.J., to attend BedBug University’s Boot Camp Feb. 16-19, 2016. Only held three-times a year, the boot camp is an intensive four-day, hands-on training session that covers all aspects of bed bugs, including: biology, history, treatment and monitoring, focusing on BedBug Central’s unique “No Prep” approach. Additionally, the class covers all the business, legal and administrative challenges that are unique to bed bug treatment. Jeremy Scott Goins of Pesky Critters in Troy, Mo. decided to attend the boot camp to help gain the valuable knowledge and insight on all the aspects of bed bugs. Masters Pest Control, located in Port Jervis, N.Y., sent Tyler Fetherman and Mike Smith to experience the boot camp since bed bugs are becoming more prevalent in their service area. Also in attendance was Carl Boykins of Rest Easy Pest Control in Glen Cove, N.Y., he already has several years of experience with bed bugs, but was looking to expand his education and training on steam treatment protocols. On the first day attendants went through a full-day of classroom training with BedBug Central’s Technical Director Jeff White. The following day the participants were split into small groups and received hands-on training at a local hotel. Cooper Pest Solutions trained technicians demonstrated how to execute initial bed bug procedures and follow-up treatments. Following the hotel training, attendants were then transported to actual bed bug infestations, where they performed the initial and follow-up treatments with supervision from technicians. On the third day, Phil Cooper, CEO of BedBug Central, provided the attendees with valuable information on all the business, legal and administrative challenges associated with bed bug treatment programs. Amanda L. Eiden, postdoctoral research associate at Rutgers University, said that her experience going through the boot camp has expanded her perspective on how her research can better suit pest control businesses. She also said she found the business training to be very helpful from an academic standpoint. Goins added that all of his training and education he received from the boot camp will be brought back to his company, where he plans to restructure his current bed bug protocols. Additional benefits of BedBug University’s boot camp is the expedited approval process in becoming a bedbugFREE member. Upon completion of boot camp, Pesky Critters, Masters Pest Control and Thur-O Pest Management of Exton, Pa., all received their bedbugFREE membership. Rest Easy and Preventive Pest Control of Houston also participated in the boot camp, but received their bedbugFREE membership at a prior boot camp attendance. BedBug University’s next boot camp will take place Aug. 9-12, 2016 at BedBug Central’s headquarters located in Lawrenceville, N.J. Applicants interested in attending can register on BedBug Central’s website. Kyrie Irving said it wasn't a stomach bug that caused him to miss most of the Cleveland Cavaliers' win over the Oklahoma City Thunder on 2/21. It was actually a bout with bed bugs from the night before, ESPN reported. OKLAHOMA CITY -- Hilton Hotels apologized Feb. 23 after Cleveland Cavaliers guard Kyrie Irving said he was bitten by bed bugs during a weekend stay in downtown Oklahoma City. As ESPN.com reported, Irving played just nine minutes (in a Feb. 21) win over the Oklahoma City Thunder. Irving said he was suffering from sleep depravation and a sore back after discovering bed bugs on a pillow, forcing him to sleep on a couch instead of his bed at the Skirvin Hilton. "The comfort of our guests is a top priority, and we are very sorry to hear about Mr. Irving's stay," Hilton said. "Since bed bugs can be easily transmitted anywhere and are often lodged in luggage or on clothing, our hotel maintains high levels of vigilance and we perform regular inspections." Irving said he had just three hours of sleep the night before the game and felt nauseated. As he told ESPN.com, "Our team said I was out with flu-like symptoms," Irving said after the Cavs' 96-88 loss to the Detroit Pistons on Monday. "It was honestly from the bed bugs from the frickin' Hilton that we stayed at." The Cavs, like most NBA teams that visit Oklahoma City for road games, stayed at the historic Skirvin Hilton Hotel. A spokesperson for the Skirvin confirmed to ESPN.com that there were indeed bed bugs found in Irving's room. "Unfortunately, every hotel occasionally has a case of bed bugs," the spokesperson said. "This is one of those cases where a guest did bring in bed bugs to this particular room, and it was reported to us, fortunately, and we responded immediately and put the room out of order and all of the surrounding rooms to be inspected by a professional company. "We actually had the company come out first thing [Monday] morning, and we found it was an isolated case in the one room, and we're taking the necessary steps to remediate the problem. 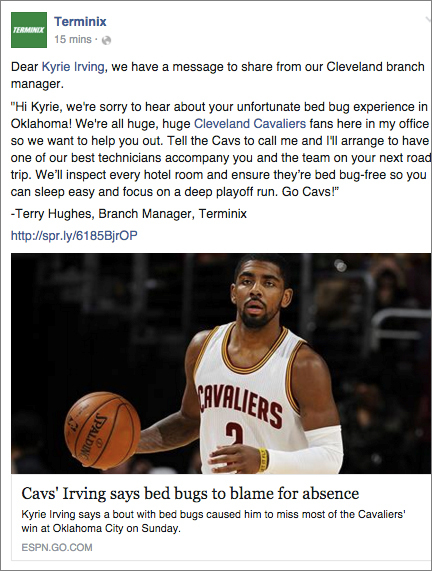 Terminix responded to Kyrie Irving’s bed bug woes by offering to send its best Cleveland-based technician with the team on their next road trip to inspect every hotel room and ensure they are bed bug-free. The pest control company announced the news in a post on Facebook. Dan Gordon, president and owner of PCO Bookkeepers, is a CPA and former pest control owner/operator. In the following article, Gordon reviews the importance of a budget and how PCOs can formulate one. Editor's note: Daniel S. Gordon is a pest control operator turned CPA in New Jersey. He owns an accounting firm that caters to Pest Control Companies throughout the United States. Visit www.pcobookkeepers.com for information about his firm, PCO Bookkeepers. He can be reached at dan@pcobookkeepers.com. In the following article, Gordon reviews the importance of a budget and how PCOs can formulate one. How do you keep score in your business? How do you know if you are winning or losing? Is it money in the bank? Profits? Growth? All of the above! Budgeting is key to your operational and financial plan. But how do we formulate a common sense budget that is useful that is simple to understand and prepare? We start by understanding our vision. Knowing what you want to accomplish strategically is absolutely vital and measuring against this objective is paramount. A budget is your game plan. Budgeting is nothing more than formulating a coherent financial plan for some period in the future, usually one or two years. As the plan is implemented we are able to rate our efforts compared to the budget that we created. Budgeting allows us to predict the amount of technicians, vehicles, equipment, etc. that we will need in the future based on our revenue projections. Budgets are prepared for a specific time period. They are often created for a year at a time, but you may also want to budget on a monthly, quarterly, or semi-annual basis. Even if you prepare a budget based on a year, you should seriously think about breaking it down on a month by month basis. Accounting programs such as QuickBooks makes this easy by offering a variety of formatting options. What percentage growth do you expect in revenue? How much will you sell to existing customers? How much do you expect to sell to new customers? How many technicians or laborers will be in your organization and what will they be paid (total direct wages)? Advertising costs – How many leads do you want and how much are you willing to pay per lead? General and Administrative Costs - what will it cost to maintain the office, the functions performed in the office, and the people to run the office? The gross margin concept is extremely important in that it allows a business to understand how much business must be done in order to breakeven. Using the gross margin approach a business owner can analyze his pricing strategy in order to determine if and how much profit can be made based on the current capacity of his firm (i.e. number of people and assets). The gross margin must be budgeted for depending on the service line (i.e. lawn care, maintenance, irrigation, etc.). Each service line will have a different gross margin. For more on gross margins see my article “Why Gross Margins Matter” Landscape Management, October 2014 p 78. It's also a good idea to consider when income and expenses will be incurred. For example, if your firm is highly seasonal most of your income will be received during the warmer months. Budgeting your annual income evenly over twelve months would not accurately reflect your situation. A much better approach would be to budget the income and expenses for the months you actually expect to receive or pay. When you created your chart of accounts, you created a list of general categories such as various revenue types, office expense or repairs and maintenance. When creating your budget look at your chart of accounts and code your revenues and expenses in those categories. If you use QuickBooks, you can actually enter your budget into the program and produce actual vs budgeted numbers reports. A critical element in delegation of work and authority is assigning responsibility for expenditures and bottom line outcomes. At the beginning of each period, identify the amount of money budgeted for in each area of your business and assign that area to a manager. Then on each reporting period, check the results of their expenditures against the amounts budgeted and how that person did in terms of working within the budgeted amounts. Perhaps you can include an incentive program for those who come in under budget. Whether in the corporate world or the world of small business, it is human nature to spend all the money in the budget because there is always some piece of equipment to upgrade or replace. Put a price on resisting that urge, and don’t forget to explain all the reasons behind the budget decisions. Know where you want to go in your business in terms of growth, profitability and timeframe. Make a plan. Reduce the plan to a line by line budget and execute on the plan. If you take these steps in the future you should find that you have better visibility and may avoid costly errors. The conference, scheduled for March 2-4 in Troy, Mich., is open to active industry professionals and includes a variety of training sessions and leading educators who will address the latest in pest management techniques. TROY, Mich. – Rose Pest Solutions announced that registration is now open for its 2016 Technical Conference, which will be held March 2 – 4 at the Detroit Troy Marriot, 200 W. Big Beaver Rd., Troy. The two-day conference is open to active industry professionals and includes a variety of training sessions and leading educators who will address the latest in pest management techniques. Rose Pest Solutions was founded by Solomon Rose in 1860 in Cincinnati, Ohio. Today, the Troy, Michigan-based company provides comprehensive pest control services for homes and businesses in Michigan, Ohio, northeast Indiana, northern Kentucky and western Pennsylvania. Cost to attend the Rose Pest Solutions Technical Conference is $375 for both days with meals and $275 for both days without meals. Pesticide applicator credits are available for all professionals who reside in Michigan, Ohio, Indiana, West Virginia, Kentucky and Pennsylvania. For more information and to register, contact Rose Pest Solutions Manager of Education and Training Mark VanderWerp at (248) 588-7005 or via email at mvande@rosepest.com.